1. 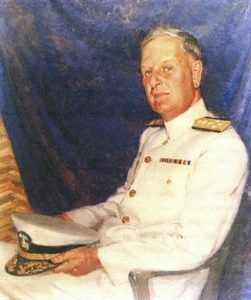 Admiral Husband E. Kimmel began his duty as a Commander-in-Chief of the United States Pacific Fleet in January 1941, and assumed a temporary rank of admiral in February of the same year. 2. The four-star admiral was relieved of his command ten days after the attack on Pearl Harbor in December of 1941 and forced into retirement with only two stars, making him one of two World War II flag officers not to be retired at the highest rank held during the war. 3. Eight official investigations have been conducted to determine his level of accountability for the attack, considerably damaging his reputation. Kimmel defended his position, testifying that important information was never made available to him. Though he was exonerated in 1999 by congress, he has yet to be cleared by any president or regain his four-star status. 4. Husband E. Kimmel was born in Henderson, Kentucky. He lived with his parents and six siblings at 512 North Green Street. Historical marker #878 marks the site of the Kimmel family home, and stands very close to where the house once stood. 5. Admiral Kimmel graduated from Henderson High School as a valedictorian of his class at the age of only 16 years old. He went to Centre College for one year until he was appointed to the United States Naval Academy in 1900, and graduated with honors in 1904. 6. Admiral Kimmel’s father, Army Major Manning Marius Kimmel, fought in the Civil War for both the Union and the Confederacy. 8. 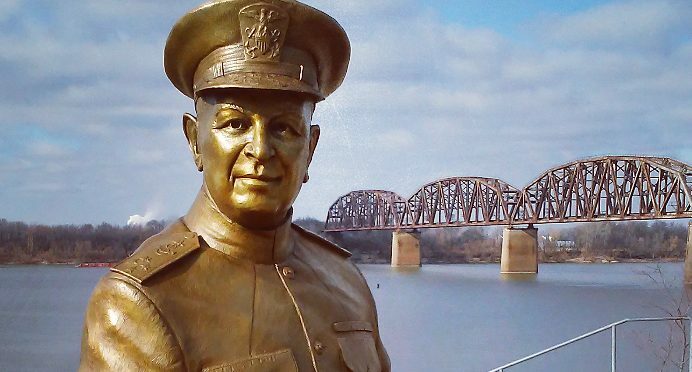 The bronze statue located on the Henderson riverfront was made by sculptor Raymond Graf of Louisville, Kentucky (the same artist that completed the sixteen sculptures in the Audubon Downtown Sculpture Tour). If you look closely at the life-size statue, you can see the artist included the four-star recognition on the shoulders of his uniform. 9. The statue project and dedication was planned by Henderson County War Memorial Foundation, which is still seeking to restore honor to Admiral Kimmel and Lieutenant General Walter Short, both of which were treated as scapegoats for the attacks at Pearl harbor. The Henderson County Tourist Commission was a proud sponsor of bringing the statue to fruition, contributing to the project’s cost, which totaled over $100,000. 10. Community members have the opportunity to purchase at brick at the statue site. Each brick surrounding the Admiral Kimmel statue can be memorialized with your or a loved one’s name, a great Christmas present idea for those members of your family that have strong ties to the history of Pearl Harbor. The bricks can hold up to three lines of text (each line holds 16 characters), and are available for $100 on a first-come first-serve basis, and they are tax-deductible. To place an order or for more information, please email kbc@twc.com or you can visit www.hendersonwarmemorial.org.